Update, March 27, 2017: I am compiling a list of maps recommended by people who find problems in the ways their own peoples/nations are depicted on Carapella's map. Eds. note, Aug 16, 2016: Scroll down to see comments from others who noted problems with these maps. Eds. note, Aug 17, 2016: Carapella has threatened legal action if I do not remove this review. I (Debbie) stand by my review. Eds. note, Aug 23, 2016: Carapella has written to say he is sorry for saying he would take legal action for my review. Back in 2014, I began to receive emails from Aaron Carapella, asking me to promote his Tribal Nations Maps. I took a look and found problems with it. Carapella saw my review and sent me a revision to that portion of the map. But--it still has problems. Because Carapella launched a go-fund-me page to solicit funds to distribute the maps to schools, I'm back with this 2nd look at his map. This map presents every documented, known Native American tribe that was here in pre-contact time, before the arrival of Europeans. All of the tribal nations documented here are in their original locations before the European Invasion affected their movement and displacement. Most of the names of tribes are in their own language, and are not the names given to them either by the invading Europeans or even other tribes. For example, we correctly use the name Numinu for what most Americans would call the Comanche Nation. The Sioux are referred to here in their own language as the Lakota. 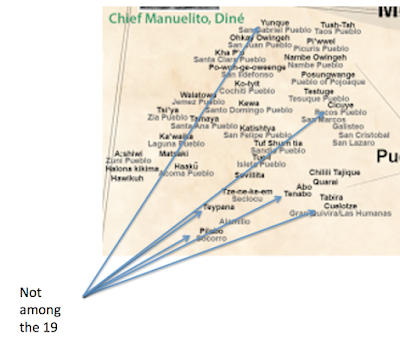 Unfortunately, many of the tribes here are indeed listed by their given name. Their original names were lost in the War against the Indians which left many tribes numberless, or forced remnant bands to amalgamate into larger, stronger tribes. We seek here to honor those hundreds of tribal nations who existed in their respective territories for millennia unscathed until the encroachment of Europeans. This is a tribute to all of those forgotten tribes whose names had been lost to the wind, but who live in the hearts and minds of modern-day Native Americans who managed to survive the largest full-scale holocaust in Man's history. We also honor the Indigenous Nations of this land by giving them ownership of their own names for themselves. Here you will find the most comprehensive maps of pre-contact and at-contact Native North America to date. These maps use Tribal Nation’s original indigenous names for themselves, and show where Tribes were just before contact with outsiders . The intent of these maps is to instill pride in Native peoples and to be used as teaching tools from a Native perspective. These maps are part of my Tribal Nations Map series-which cover the Nations indigenous to the “United States,”, “Canada”, "Mexico" , "Central America", "South America" and “Alaska." Your purchase supports multiple upcoming maps. I credit the many hundreds of Cultural directors, elders, educators and linguists that have helped me centralize these names onto one visual display. 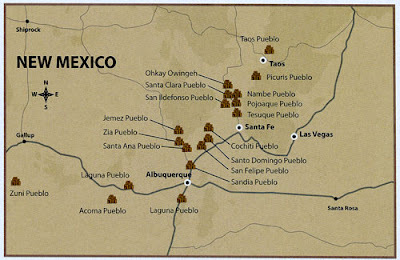 In my review in 2014, I focused on the Pueblo Indian Nations portion of the map. I'm doing that again, because that portion of the map, like the description of the project, has been revised. This review is arranged based on what Carapella said the maps would do. Carapella said that his map would show Native Nations and where they were located pre-contact with Europeans. Sounds good, right? But--I'm asking you to look and think critically about that goal. Right now there are over 200 federally recognized nations in the US (not counting Alaska). There were a lot more, pre-contact. How, I wondered, was Carapella going to show the locations of those 200+ federally recognized nations in the hundreds and thousands of years prior to contact, or "at contact"? We didn't all come into contact with Europeans at the same time. Let's hone in on an example. The place my nation (Nambé O-Ween-Gé) is at right now is where we've been since the early part of the 14th century. If you go back further in time, we were somewhere else. I'm talking about places like Bandelier, Mesa Verde, Chaco Canyon... (you might know those places as where the "Anasazi" people lived, but they are now--correctly--identified as ancestral homes of today's Pueblo Indians). On his map, Carapella chose to show us at our current locations, which is fine, but that decision points to a difficulty in the framework for the project. How do you convey thousands of nations in thousands of locations over thousands of years on a single map? How do you tell students which point in time a location on a map represents? That isn't unimportant data. It is vitally important. Second, Carapella said that his maps would include nations that he called "numberless" which, he tells us, means ones that no longer exist. How, I wondered in 2014, would his map distinguish between those "numberless" ones and those that are currently recognized as sovereign nations? As a Pueblo Indian woman enrolled at Nambe, I know there are nineteen sovereign Pueblo Indian nations in New Mexico right now. There were more, pre-contact. I know the names of some of them. I think it is important to know about them, but it is also important to know they aren't among the nineteen sovereign nations who have nation-to-nation negotiations--today--with the US government. Children in New Mexico should know the names of the nineteen Pueblo Indian nations, and all children should learn about us as we are, today, rather than the tragic and romantic content they learn that confines us to the past. 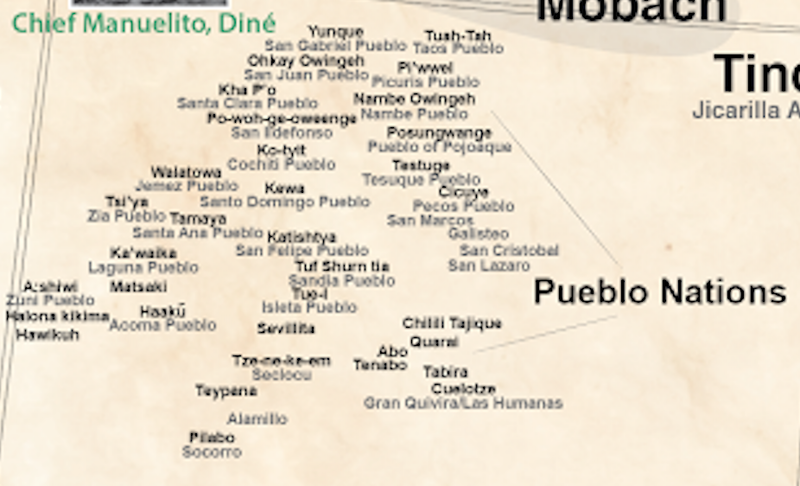 This map shows the nineteen Pueblo Indian nations of New Mexico. Note: 8/18/2016--The pueblo south of Albuquerque is Isleta, not Laguna. Thank you, Danielle L., of Isleta Pueblo, for pointing out that error. I will contact the individual who made that map. 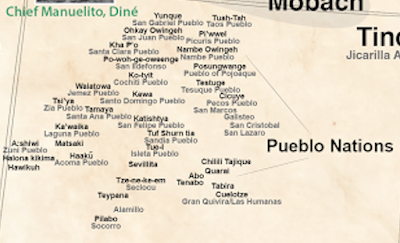 It was made to show collectors the locations of the 19 pueblos. My apologies for not seeing the error when I selected it for use, here. When I reviewed the Pueblo portion of his map in 2014, Carapella read my review and wrote to me to say he'd revise it. Last year, he sent me a screen capture of revisions he'd made. He asked me to update my review, but the revisions are just as bad as the original, so, I didn't revisit my older review. Here's the screen cap he sent me. It has way more than nineteen. The first map didn't have all of those on there. That makes this one "more comprehensive" but also more confusing! In some instances, Carapella has made a different kind of error. He correctly lists A:shiwi (Zuni) but beside it he also lists Matsaki, Hawiku, and Halona, but they're villages that are part of A:shiwi. In my earlier review, I wrote that my own village ought to be listed as Nambé O-Ween-Gé, and pointed him to our tribal seal. But as you see above, he chose to use "Nambe Owingeh" instead. Third, Carapella said his map would provide the names the nations used for themselves, rather than the ones outsiders used for them. That, too, is ambitious for many reasons. How did he find out those names? He tells us he made phone calls and visited people, but he doesn't name any names. His credit is a blanket one which tells us nothing. Because of our nation-to-nation relationship with the U.S. government, you can find a list of the 567 nations, which includes, superceded names (in parenthesis). It would be interesting for librarians/teachers to download that pdf and do some comparisons. How do the nations request they be listed? Does that match with what Carapella did? As critical users of information, one of the things we do--and teach students to do--is to ask about the sources for information we're given. Carapella doesn't name his sources for the map, but he provides a "Resource List of Books/Movies/Websites" that he recommends. It, however, has The Education of Little Tree on it. That's a huge problem! That book has been soundly discredited for its content and because its author was faking an identity ("Forrest Carter" is actually Asa Carter--speechwriter for George Wallace--and a member of the KKK, too). In short? The revisions to Aaron Carapella's Tribal Nations map of North America are not an improvement. The map is still flawed and, as such, I do not recommend it. In 2014, Annita Lucchesi posted Aaron Carapella's Tribal Maps Do Not Do Justice to Indigenous Nations and Here's Why. I linked to it in my first review and am sharing it again, here. (I edited this item today--March 27, 2017--to correct an error in attribution. Lucchesi has additional maps you may be interested in. Today, people on social media began sharing additional resources and comments about problems with Carapella's maps, including the ones of Canada. I'll be adding them as I can. Eric Ritskes pointed to Maps Are Territories. I looked at the first couple of pages and will be studying it. Terrific info. See Eric's series of tweets, too. On Twitter, Barbara Low (Mi'kmaq) wrote: He's conflating Mi'kmaq Districts with 'Nations' on his map. Those are the names of our Clan Districts, not Nations. Confusing. On Twitter, a "deshkan ziibi chippewa in unceeded coast salish territory" wrote that the Canadian version has similar problems and that Carapella failed to detail the Salish Sea places communities by linguistic group. Pamela J. Peters, a Navajo filmmaker in California, wrote on Twitter that Carapella "has been trying to get money for those maps for years" and that "some of the tribes in Southern California don't like them, and burned them." She shared a map that one of the tribes( Tataviam) did of the LA Basin. And she shared a link to American Indian Cultural Center, which has a copy of the map. On Twitter, Sarah M. Storm (she's King Island Inupiaq) wrote that she had an email exchange with Carapella in 2014 because he used a photo of her grandmother and great grandmother and had put it in Northern Canada, near Iqaliut, rather than in NW Alaska. He captioned it "Eskimo mother and child" and, she writes, "assumed it was Inuit, & could be placed anywhere." Sarah pointed out a serious problem regarding Carapella's use of that photo and others he used. Did he get permission from the families of those in the photos he used? Sarah wonders where he got the photo, and, she said "We've had so much stolen from us" and that "we continue to have so much stolen from us." Very Cool Idea, but as I have said to Mr. Carapella before, it is not accurate! Even if you list just the 566 federally recognized tribes in the United States, and use their own language to say their names he has left out MANY! This map of California (http://www.yale.edu/gsp/coloni... would have at least helped him to contact the California tribes to get correct names and placements. Example.... Howunakut is the name of a village site in Northern California's Tolowa territory, not the name of a people. Overall, I didn't recommend it when asked about a purchase. Especially because our immediate Northern Plateau tribal names and areas were incorrect. On Facebook, Aaron Carapella said that he tried to work with me, collaboratively, on this project. I never received an invitation from him to do that. The first email I got was one in which he asked me to buy one of his maps. It was a sales pitch. The wording in it was such that I ignored it. Two days later I got that email again. Again, I ignored it. Two months later, I got another one. In the interim, I'd received a lot of emails from others who had also gotten them and wondered if I had seen and reviewed them. When people start to write to me about something like that, I generally respond. So, I reviewed Carapella's map on June 25th. I reviewed the pueblo portion of your map and found problems with it. A link to my review is below. In it, I suggest that individuals that have bought it do revisions. It is a great exercise in editing for students. And--I hope you can do revisions to future versions of the map. I've also heard from a lot of people that the information you have for their nations is not correct. I think the idea is terrific but the actual map needs more work. He wrote back, saying that had read my review and the comments people submitted. What I saw and reviewed, he said, was an outdated map and that he had already corrected what I pointed to in my review. He hoped to get the new revised map uploaded soon. He then went on to say that one of the people who commented on the review is a "naysayer" -- which is a term he is now using about me, along with "hater." I appreciate that he is making revisions all the time, but what about all the people who buy earlier, flawed copies? The maps are expensive. I wonder if they're getting a free update. I wonder if they know that his maps are a "work in progress" that is continually being updated? It seems to me that, at the very least, the maps were released too soon. There are many valid questions being raised about accuracy and about protocol, too, regarding the use of photographs without permission. As I've said, I have questions about the accuracy and whether or not all that he means to convey CAN be conveyed in a single map. On October 24, 2015, he wrote to me again, with a screen capture of the updates. As I noted above, that screen capture was what I used for the second review. Some people think that his map is better than nothing and that it is wrong for me to criticize him. I think that although he meant well, he's contributing to the already too massive body of misinformation about who we were, and who we are. I focused on errors on the Pueblo portion of his map. Others are commenting--and continuing to comment on--errors in how he's depicted others. On Aug 16, 2016, wrote to tell me that he will take legal action if I do not delete my reviews. I replied on Facebook and on Twitter that I stand by my reviews and will not delete them. Kim Patrick Weaver used a series of tweets amongst several people to create a Storify about the Haudenosaunee content of the maps: Printed Maps a Poor Choice for Indigenous History. There's an active discussion going on at my Facebook post, dated August 16 at 6:29 AM. Many There, several Native scholars, librarians, and educators are sharing their comments with Carapella. See substantive comments from Kara Stewart, Laura Grabhorn, and Deb Krol. Their discussions highlight other dimensions of the difficulties of a map, including federally recognized/state recognized/unrecognized nations. Some reference previously done maps and problems with them, too. Carapella sent me another private message on Facebook, apologizing that he said he was going to take legal action against me. He has decided not to do that. Hayden-McNeil is part of MacMillan, which is a major publisher. That prompts many questions. In the threads on Facebook, Carapella writes that he is making revisions all the time, based on input. Revisions are good, but that also means that the maps are not ready for use with children in a classroom, or in a textbook, either. I hope that Hayden-McNeil (MacMillan) is aware of these errors/revisions, and I hope they're aware, too, that it is necessary to get permission to use the photographs on the maps. Some of the photographs may be in the public domain, suggesting that permissions aren't necessary, but taking that approach is problematic, too. Native peoples have been exploited by photographers for so long, that many tribes now have protocols specific to photographs and video recordings. "We didn't all come into contact with Europeans at the same time." The sweeping U.S. mythology around Columbus and Thanksgiving are not only false and simplistic, they're ungodly persistent. Excellent points made here. While I salute Mr. Carapella's ambition in this project, the fact that the execution is lacking is unsurprising. There are a number of problems in trying to create a map like this. To begin with, the idea of a political map (a map that delineates the boundaries and territories of sovereign territories) is a European invention, rooted in the idea of nation states with defined sovereign territories (a concept that didn't really exist until the 1648 Treaty of Westphalia.) Applying this principle to regions and periods that existed prior to this idea, or that did not subscribe to it usually involves a lot of guess work. These problems are particularly evident in attempting to map Native American nations prior to European contact. While specific locations of established villages and cities can probably be done with some degree of accuracy, charting the range of influence of specific Native nations pre-contact is much more difficult. What methodology did Carapella use to do this? I suppose language and tribal history (inasmuch as Native descriptons of landmarks can be reconciled to western cartography) can provide some guidance here, but unfortunately, most of this data probably comes from Euro-American descriptions of first contact with Native nations and their estimates of the extent of these groups. Such descriptions of course do not take into account the devastating effects on Native populations of European diseases such as smallpox, while making the assumption that these boundaries were static prior to contact with Europeans. Finally, there is the fact that while such a map works when dealing with sedentary populations in established territories, it is wholly inadequate for dealing with nomadic groups. Such groups ranged over hunting territories, which potentially overlapped with other nomadic groups. How do you effectively represent the "territory" of such groups? Thank you for your concern for accuracy in Original peoples' history. I will share this with my associates at Universty nehulotine thayotsi nistameyiminakanak Blue Quills at the Blue Quills Reserve in Alberta, Canada. Thank you Debbie For keeping up to date on this. I liked the fact that he is a business major who dabbles in cartography. Wish there was a way to get this to more educational institutions/schools so teachers won't waste their time and money. I have a bibliography in progress right on my website Debbie. Your failure to appreciate my work is well-underscored. Imagine someone doing maps like these with zero political or community negative response in the age we live in. So many of the points you make are a result of refusing to dialogue directly with me. I have dedicated my life to helping direct injustices against our Native peoples, and the majority of people appreciate my efforts. Countless people have written to me to say that your reviews show an unhealthy disdain and negativity.It doesnt matter what I do-you'll always hate my work. Only you would determine that they are "not an improvement" after 2 more years of work into them. I sincerely hope that you learn to deal with the hatred in your heart Debbie. I love what he did. And what you are all doing is building on what he did and that's beautiful that's beautiful is like an archaeology archaeological dig bless him for having got a good base and place to start. now with his work and your research important information will never be lost. Does a more accurate map exist? I notice most of the commenters here and in the 2014 review are from current tribes and not one of them suggests a better national map. I also notice many of the complaints involve a denigration of "numberless", a mismatch of old vs current territories, and problems with spelling. All three of these might easily be attributed to political rather than scholarly interests. The source materials often display wide variations in spellings, which is understandable given the lack of any written history by the tribes themselves and hence a reliance on phonetic spellings based in oral tradition. For a school child the wealth of information presented, including the critical idea that many of the common-usage Western-assigned names are wrong, has tremendous teaching value. I fear many of the reviewers are more concerned with current territorial claims, where prior locations and the inclusion of prior "numberless" groups dilute the strength of their current positions in a court of law or in negotiations. Those are not the goals of a scholar. A map is more art than science; decisions made about what information to display on a map are arbitrary and up to the discretion and creativity of the cartographer. While specificity is important in some maps, more important is the purpose of the map. Some are intended to be graphically beautiful, expansive and thought provoking. Others may be accurate, factual, sterile displays of well calculated information. To be statistically accurate, a map must be specific regarding time and place... like when I used to routinely change geophysical maps based on the latest seismic information. Clearly Aaron's maps are painting across a broad stroke of time, place and culture; criticizing his maps for their comprehensiveness reveals a lack of understanding of the grueling editing process required to deduce information from centuries of human activity to fill a few limited spaces on a 3'x4' map. Language is also relevant to time and place and culture. Again, the decision to follow a specific format and not others, is entirely up to the designer. Many centuries of linguistic evolution are represented on Aaron's maps. He had to make the creative decisions of which to display and which not to display. I do not know his reasons, but I do know... it's his call. And there is no right or wrong. I might have done it differently, you might have done it differently... but that does not change the fact that Aaron did it... and did it well. Thank you so much for your thorough explanation of a very sensitive subject. As someone who grew up in New Mexico, I find Mr. Carapella's project ambitious yet missing too many salient details. When I found his map up on the wall in the map library at my new position, I took it down as I do not wish to have inaccurate materials in our map collection since I serve many Indigenous people. It is a fine line to serve both academics who demand authenticity and scholarship while at the same time a community who wishes to have information regardless if it is accurate. I truly value and appreciate the hours he took in creating this work which is truly unique. I hope there will be collaborations made to create new cartography which can chronicle the history of native peoples cogently and compassionately. There will always be human error since we are only humans yet we must bravely strive forward. Marlette,I would recommend having a conversation with Rachel Sundberg,your Yurok Nation THPO specialist,who gave me the current spellings and locations of Yurok peoples,and was kind enough to work with me. Dear Ms. Reese… please provide us with something even approaching an equally comprehensive map of the pre-Colombian Americas or at least some reasonable sense of perspective. I agree with those who you do not speak for, making this about personal attacks rather than real information is precisely why it took so long for anyone to dare to embark on such an ambitious project. Like all works of art and ethnography, it is an ongoing process; it improves with every constructive criticism, with every voice included and is lessened by every attempt to exclude brave voices. I also find it a shame and unnecessarily spiritless when the self-righteous simply seek to destroy another person’s work. Like many non-Natives, these maps were a way into the pre-Columbian world, a way of teaching the overwhelm numbers of ignorant non-Native peoples about how complex and diversified Native cultures and peoples were prior to the waves of invasions, making them an excellent education tool. Unlike books, maps explain so much without words, even when they aren't perfect. 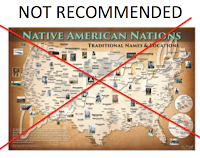 If you have better maps on your people, then share, don't denigrate the only available option worthy of the name that has been researched with the aid of thousands of voices of Native elders and tribal historians. I agree with comments that no project is perfect, and that progress made in adding to this knowledge is well worth supporting. It seems that a more useful way to use additional knowledge for those who are fortunate enough to have it would be to share and collaborate, instead of criticizing. Fact is that Aaron Carapella has started sicing his friends on this post to come to his defense. So those anonymous posters and White posters are simply here to defend him rather than understand the harm this innacurate material provides. And Mr. Carapella just sounds whiny of "I did SO MUCH WORK. Why don't you appreciate me??" If he's not going to listen to those of the Native American nation he shouldn't have created the map. Intent means nothing and a "map" is not just a piece of art but a historical reference. Do you want your Google Map of how to get to a specific location to be pretty or accurate? I'm disgusted by how Mr. Carapella is acting and basically the bullying he's encouraging. Thank you as always Debbie for your work. You didn't even have to engage with him at all and this is how he treats you. Mr. Carapella, basically your attack on Debbie is disgusting (especially encouraging your friends to comment who have no context or similarly do not care about Native representation which is often appropriated and mishandled and disrepected. Your response to requests for accuracy privileged. And the fact that Debbie OR ANYONE gave you advice on how to make this accurate is a kindness on their part. You are yet another privileged white male seeking validation for work no one asked you to do. And yet when you do it WRONG you are whining about it instead of learning. Debbie's space is a valid space for critique because she IS Native American. I'm hoping more news outlets pick up on this and your behavior specifically. I know I'll be reaching out to various outlets to further note Debbie's work and standing in the community as a scholar and advocate and yours as being yet another privileged artist wanting cookies. On Facebook, Aaron Carapella said that he tried to work with me on this project. My first email from him was not an invitation from him to help him with the project. The first email I got was one in which he asked me to buy one of his maps. It was a sales pitch. The wording in it was such that I ignored it. Two days later I got that email again. Again, I ignored it. Two months later, I got another one. In the interim, I'd received a lot of emails from others who had also gotten them and wondered if I had seen and reviewed them. When people start to write to me about something like that, I generally respond. I think the idea is terrific but the actual map needs more work." He wrote back, saying that had read my review and the comments people submitted. What I saw and reviewed, he said, was an outdated map and that he had already corrected the items I pointed out to in my review. He hoped to get the new map with revision uploaded soon. He then went on to say that one of the people who commented is a "naysayer" -- which is a term he is now using about me, along with "hater." I appreciate that he is making revisions all the time, but what about all the people who buy earlier, flawed copies? The maps are expensive. I wonder if they're getting a free update. I wonder if they know that his maps are a "work in progress" that is continually being updated? Some people think that his map is better than nothing and that it is wrong for me to criticize him. I think that although he meant well, he's contributing to the already too massive body of misinformation about who we were, and who we are. You should stand by your reviews. He has no legal recourse but if he wants to threaten lawsuit than you also have a case where you can state how much he's said libelous things about you in various public forums. Shoot, I'll take screen caps as evidence for a case against him. He's trying to sell invalid material to the community itself as an outsider. The audacity is ridiculous. Criticism is necessary in the scholarly world. If we didn't have criticism I'm fairly certain Jim Crow would still be around. You are obviously one of Aaron's friends here just to make noise but your argument, like his, is invalid and insensitive. For someone with a PhD in visuals I find it hard to believe you'd want an inaccurate map in this world. Essentially what you're saying is "maps aren't perfect" so if Google Maps is inaccurate than it's okay because hey it doesn't matter that it sent me to Maryland instead of Maine, nothing is perfect! That's flawed thinking and I find it insulting to hear from an educator in this regard. Criticism is vital as is hearing both sides. This is mainly "I'm sorry the white guy who didn't get it right feels bad so let me chime in" instead of listening to persecuted communities. Privilege at work. The idea that bad information is better than no information is as much of a falsehood as the idea that Native Americans have no history to document. The idea that creating a map absolves Mr. Carapella of the responsibility to think critically about what maps are and what they say about Native life is a falsehood. The idea that intending to use "original names" for Native nations absolves Mr. Carapella of the responsibility to get those names and locations correct is a falsehood. The idea that only a single national map has value and only this map can be used to teach Native history is a falsehood. The idea that every Native nation can be meaningfully pinned down to a single pre-contact spot on a map is a falsehood. The idea that asking someone to approve of your project uncritically is "collaboration" is a falsehood. The idea that presenting the issues with a project critically and fairly is a personal attack is a falsehood. 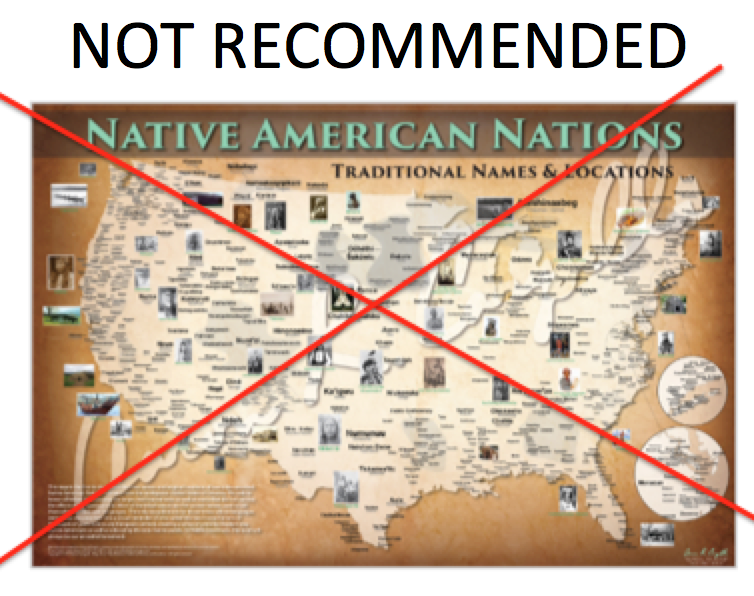 If Mr. Carapella wishes to work on behalf of Native people, he should thoughtfully consider the objections raised by multiple people about this map and how many have said that it misrepresents Native life and history. If he disagrees with those specific critiques, he should be prepared to give an explanation as to why he chose a particular path. That explanation should not be "I'm still working on this but am willing to sell incorrect and misleading maps to people in the meantime and bad information from me is better than good information from other people." Jenn Mr. Carapellea has a right to defend his integrity and IS A NATIVE AMERICAN! Being a mixed blood DOES NOT absolve someone of their native identity! It is DEBBIE who has had a personal vendetta against Aaron! Aarons supporters and colleagues have a right to come a defend his integrity who better to vouch for his work then other full blood natives which can be seen in his comment thread along with many other educators both native and non native following Aarons work! This man has been in the trenches fighting for native rights as an active member of AIM. He's no opportunist or new kid on the block. He has lived and breath the native way his ENTIRE LIFE and has the track record that speaks for itself! I hope Debbie does get SUED for her slander. Debbie being a full blood native American doesn't absolve her from human error or being a down right nasty person. Aaron has been working on this project since he was a teenager! Volunteering and serving the native community Jenn what have YOU done for the native community?! Now have several seats. It seems to me that maps are a serious business and perhaps printing and constantly revising maps and selling them is not the correct model for mutual and respectful agreement about the content of these maps? Perhaps, the research and consultation with tribal elders and scholars should have been done prior to printing them? Rather than disseminating inaccurate maps as part of a sort of process of "evolving" the information they contained? Also, it is not our way to do things without full consultation and 100% agreement. Stories and cultural knowledge are not the purview of one person. They come through mutual and complete consensus. This map is very misleading in the location of the Cherokees where it has 'Ned Christie - Ani'yunwi'ya' in Tennessee. My great-great grandfather Ned Christie was born in the Oklahoma Indian Territory/Cherokee Nation. Still don't understand why his image would be on this map since he never set foot in Tennessee. I believe the Cherokee were located in (Western) North Carolina, and in East Tennessee not the whole state of Tennessee. Yes! I wondered this too when I received his map.... it was wrong. I bought it because I am Cherokee and I wanted to see where he had us located. And I wasted 60 dollars. I've deleted my original comments. I agree that as a non-native, I have no first-hand knowledge of the issues involved. Therefore, I leave it to those in the native community to defend and/or critique Aaron's work. Thank you for this continuing review, and for the comment on his GoFundMe that linked to this. I had some misgivings about the maps-- "at time of contact" was inherently problematic, and it was unhelpful to have names and pictures in big and small rather than some kind of overlapping zones to show where tribes were known to have lived. The loss of so much history would make it impossible to have any kind of accurate map, especially over an indefinite period of time like this one... but I'm a fiction writer working on an alternate-history geopolitical map, and I was about to buy a set of his maps just to have some new ideas for my project. After reading your review, I no longer plan to. Even a fantasy writer prefers legit research over guesswork, if only so we know which parts of our novels are fake. Besides... I was inspired to alter state boundaries based on conversations with Lakota friends. Using bad information feels like an insult to them, and to their efforts to educate stupid 20-somethings like me. Thank you for this work. I've recently started becoming curious about the history and culture of the native peoples of the west coast prior to European colonization & conquest, and when I saw an article about this map posted on Facebook by NPR, my first thought was "That's so cool, I should check it out!" However, as Matt Baker above, as a non-native I have no first-hand knowledge, so I have no means of distinguishing accurate information. Before seeing your work here I was ready to take that map as it was without any way of knowing better. I still don't have any way, but now at least I am aware that there are diverging perspectives and that I would be wise to proceed with humility. Ꭷ Neta, I agree. I am not a Christie descendent but I have many friends from Wauhilla and Rocky Mountain that are, I'm inclined to think that they are not supportive but to be fair I haven't asked them. It looks like the project made a not-so-good kickoff, and now heading toward a dangerous pitfall. I am currently working on making a kind of "World Map of the Scripts" (phew!! ), so I understand how such a project can be a nightmare full of ambiguousness and hard decisions, and lots of mistakes. These projects overstretch both in time-span and geo-span, making building a uniform principle for the whole project (which is crucial) extremely unlikely. It clearly looks like the original author is overburdened with accuracy acquisitions, decisions which can hardly make satisfactory results, and lack of a thorough understanding about the details of histories of each regions. And now he grew defensive about his achievements, a state which has been always a source of major delays (or even setbacks) in the human history. My suggestion is, this project should be handed over to a much larger and responsible group. Perhaps a consortium of peoples from multiple regions and disciplines. This won't be accomplished in the hands of a single person or group, even though the author is already running the sale of the 'alpha-version' of the maps (regrettably! ).